St. Isaac's Cathedral was built 40 years, and when finally removed from his scaffolding, the need for the construction of the temple disappeared almost immediately. About who built the famous temple, how many reconstructions he experienced and what legends surround him — in the material of the portal "Guide for you". St. Isaac's Cathedral of Auguste Montferrand was the fourth Cathedral built on this square. The first Church in honor of St. Isaac of Dalmatia was built for workers of Admiralty shipyards almost immediately after the Foundation of St. Petersburg. Or rather, it was rebuilt from the building of the drawing barn under the leadership of Harman van Boles. Peter I, who was born on the day of St. Isaac's, in 1712 married here with Catherine I. Already in 1717, when the old Church began to decay, a new stone building was laid. The construction was under the direction of Georg Mattarnovi and Nicholas Herbel. Half a century later, when the second Peter's Church became unfit for use, the third building was laid — already in another place, a little further from the Bank of the Neva. Its architect was Antonio Rinaldi. The competition for the construction of the present St. Isaac's Cathedral announced in 1809 Alexander I., Among its participants were the best architects of his time — Andrian Zakharov, Andrey Voronikhin, Vasily Stasov, Giacomo Quarenghi, Charles Cameron. However, none of their projects satisfied the Emperor. In 1816, on the advice of the head of the Committee for buildings and hydraulic works Augustine Betancourt, the work on the Cathedral was entrusted to the young architect Auguste Montferrand. The decision was surprising: a lot of experience in the construction of Montferrand was not — it has proven to be not buildings, but drawings. Inexperience of the architect played a role. In 1819, the construction of the Cathedral began on the project of Montferrand, but only a year later his project was thoroughly criticized by a member of the Committee on buildings and hydraulic works Anton Modui. He believed that the planning of the foundations and piers (support pillars) Montferrand made a gross error. This was due to the fact that the architect wanted to make maximum use of those fragments that remained from the Cathedral of Rinaldi. Although the first time Montferrand all the forces fought back against critics of Modui, later he agreed with the criticism and the construction stopped. In 1825, Montferrand designed a new Grand building in the style of classicism. Its height was 101.5 meters, and the diameter of the dome — almost 26 meters. Construction was extremely slow: it took only 5 years to create the Foundation. For the base I had to dig deep trenches where hammered tarred piles — more than 12 thousand pieces. After that, all the trenches were joined together and filled with water. With the onset of cold weather, the water froze, and the piles were cut down to the ice level. Two years left for the installation of four columns, covered galleries, porticoes, granite monoliths that were supplied from the quarries in Vyborg. The next six years were built walls and domed pillars, another four years — the arches, dome and bell towers. The main dome was made not of stone, as it was done traditionally, but of metal, which greatly facilitated its weight. When designing this design Montferrand focused on the dome of the London Cathedral of St. Paul Christopher Wren. The gilding of the dome took more than 100 kilograms of gold. The sculptural decoration of the Cathedral was created under the leadership of Ivan Vitali. By analogy with the Golden gate of the Florentine baptistery, he produced impressive bronze doors with images of saints. Vitali also created statues of 12 apostles and angels at the corners of the building and above the pilasters (flat columns). Above the pediments were placed bronze reliefs of biblical scenes in the performance of the Vitali and Philippe honoré Le Maire. Also in the sculptural decoration of the temple was attended by Peter Klodt, Alexander Loganovsky. Work on the interiors of the Cathedral was 17 years and ended only in 1858. Inside the temple was decorated with precious stones - lapis lazuli, malachite, porphyry, different types of marble. The main artists of his time worked on the painting of the Cathedral: Fyodor Bruni wrote "the Last judgment", Karl Bryullov — "the virgin in Glory" in the ceiling, the area of this painting is more than 800 square meters. The iconostasis of the Cathedral was built in the form of a triumphal arch and decorated with monolithic malachite columns. The icons made in mosaic technique, was created by painting original Timothy Neff. Mosaic decorated not only the iconostasis, but also a significant part of the walls of the temple. In the window of the main altar was a stained glass window with the image of the" Resurrection of Christ", made by Henry Maria von Hess. 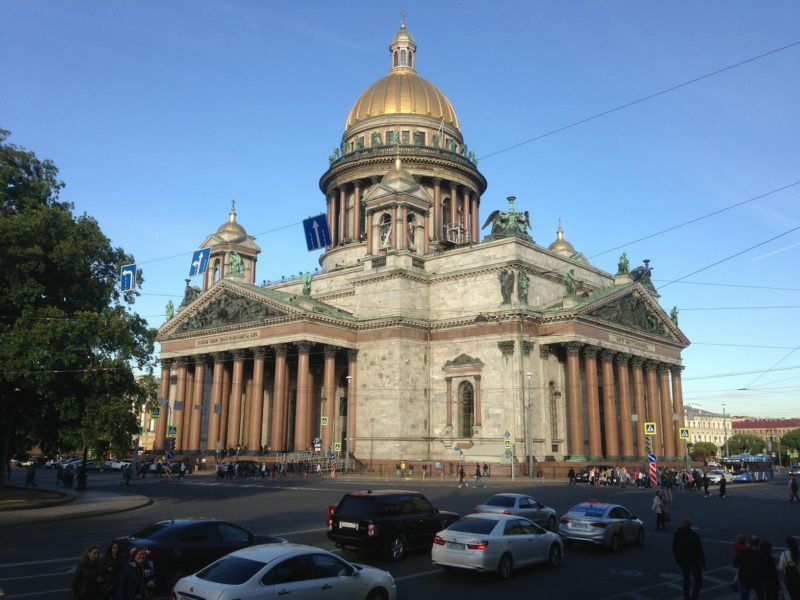 At the time of construction, St. Isaac's Cathedral became the most expensive temple in Europe. Only laying the Foundation took 2.5 million rubles. All in all, Isaac cost the Treasury 23 million rubles. For comparison, all the construction of the St. Isaac's Trinity Cathedral was worth two million. This was due to the Grand size (the Church is still one of the largest cathedrals in the world), and the luxurious interior and exterior of the building. Nicholas I, taken aback from such costs, ordered to save at least on utensils. The consecration of the Cathedral was held as a public holiday: it was attended by Alexander II, and the event lasted about seven hours. Around the Cathedral there were seats, tickets for which cost a lot of money: from 25 to 100 rubles. Enterprising citizens even rented apartments with a view of St. Isaac's Cathedral, where you can watch the ceremony. Despite the fact that there were many people who wanted to attend the event, many of them did not appreciate St. Isaac's Cathedral, and at first because of its proportions the temple was nicknamed "the Inkwell" (Chernilnitsa ) . It was said that such a long construction of the Cathedral was not caused by the complexity of the work, but by the fact that the clairvoyant predicted death to Montferrand immediately after the completion of the temple. Indeed, the architect died a month after the consecration of Isaac. The will of the architect-to bury him in the temple — and not fulfilled. The coffin with the body of the architect was carried around the temple, and then handed over to the widow, who took the remains of her husband in Paris. After the death of Montferrand passers-by allegedly saw his Ghost, wandering through the steps of the Cathedral-to enter the temple, he did not dare. According to another legend, the Romanov house was to fall after the removal of scaffolding that surrounded the Cathedral for a long time after the consecration. Coincidence or not, the forests were finally removed in 1916, and in March 1917 Nicholas II abdicated. In the first years of Soviet power, the Church remained active, but the state did not Finance it, and all the Church values were confiscated. In 1931, the Museum opened an anti-religious Museum. One of the key exhibits was a 90-meter wide Foucault pendulum suspended from the dome of the Cathedral, which proved the fact of rotation of the Earth around its axis. During the great Patriotic war in the cellars of Isaac was a warehouse, where the Museum values were stored, which did not have time to evacuate. As the dome of the Cathedral was used by German pilots as a landmark, they did not shoot directly at the Cathedral — and the vault remained intact. However, the Cathedral still suffered during the war: exploding near the temple fragments damaged the column, and the cold (during the blockade of Isaac was not heated) — wall paintings.